The American Musical Theatre LIVE! 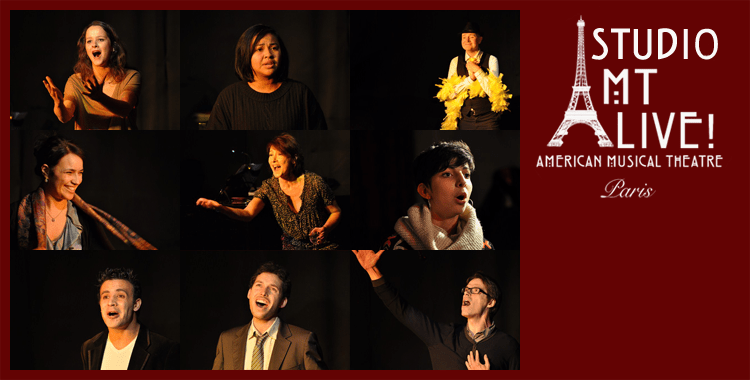 association provides a forum for collaboration between French and international performers and aims to offer as many quality learning and performing opportunities as possible. We welcome the opportunity to collaborate with industry professionals and up-and-coming performers who share our love for musical theatre. In that aim, we offer continuing studio training for professionals who wish to hone their craft and expand their repertoire in a challenging and supportive, bilingual (French and English) environment. We also offer All studio participants are eligible to perform in our cabaret series and students are eligible to audition after they have participated in our master classes. AMTLIVE! offers studio training in vocal technique, interpretation, diction, and acting for singers for professional performers and students in Paris, France. We offer weekly private voice lessons and bi-monthly studio training for performers who are looking to hone their skills in a supportive, challenging environment that stresses interdisciplinary collaboration. Performers who train with the AMTL Studio may be invited to perform alongside our resident and visiting performers in our compagnie. Contact us at studio@amtlive.org for information about auditioning for our studio training. AMTLIVE ! propose un studio training en technique vocale, interprétation, diction, et théâtre pour les chanteurs, les artistes professionnels et les étudiants à Paris, France. Nous proposons des cours de chant privé hebdomadaire et du studio training bimensuel pour les artistes qui veulent parfaire leurs compétences dans un environnement favorable et stimulant qui met l’accent sur la collaboration multidisciplinaire. Les artistes qui suivent la formation du studio training d’AMTLIVE seront peut être invités à participer aux événements tels que les cabarets concerts avec nos artistes résidents ou visiteurs. Cliquer ici pour notre programme de formation en théâtre musicale. Veuillez nous contacter à studio@amtlive.org pour plus d’informations concernant les auditions pour notre studio training.